If you’re a regular reader of this blog, you’ll know that we were inspired as a school to start challenging the amount of plastic straws that we were getting through on a daily basis following our ‘Make a Difference’ assembly topic back in September. You may remember that it all started when P4 brought a small pot of straws to our sharing assembly and told everyone that the way that they had decided to make a difference was for the 6 children who took milk each day to pour it out into a cup, rather than use the cartons and straws. They then collected the straws in the pot (below). Those 6 straws per day added up surprisingly quickly and we were all shocked by how many they had collected in such a small space of time, from so few children. We did some calculations and worked out that we could save arund 1,600 straws by the end of October (5 weeks) if we all followed P4’s example. So, each child who took milk was provided with a cup, cup washeruppers* were duly appointed in each class and we all began the challenge enthusiasically. By the end of the 5 weeks, we had in fact collected 2,312 straws (as we had forgotten to factor lunchtime milk into the original calculation) and we vowed not to go back to our old ways. It took a few weeks after that but I am delighted to announce that Abbeyhill is MAKING A DIFFERENCE to the environment as we have now got an agreement with the dairy who supply our milk (Muller) that they will give us large 6 pint jugs of milk, exactly as you would buy at the supermarket, instead of the little cartons. In the time it took to make that arrangement, the straws kept piling up and we had over 4,000 which helped us create our ‘Drowning in Plastic’ photo at the top of the page. Don’t worry, they are certainly not going to landfill as one of our artists-in-residence has grand plans for them. Come and see them as part of the Colony of Artists festival in September 2019! We only have 70 children across the school who take milk every day and look how much plastic we’re stopping getting to landfill. 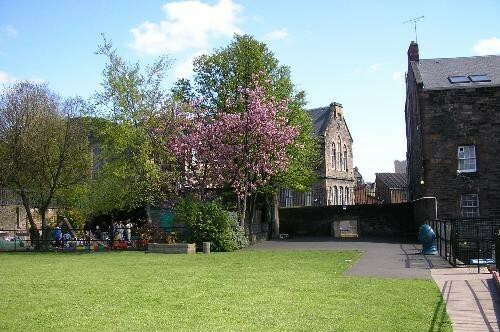 If you’re an Edinburgh school being supplied by Muller, why don’t you take up the Abbeyhill challenge and see if you can make a difference too? This entry was posted in Artists in Residence, Eco Group, Head Teacher's Blog, Pupil Council, Uncategorized and tagged Achievement, Challenge, Community, Eco, Effective Contributors, Enterprise, Head Teacher's blog, local area, Making a Difference, Pupil Council, Pupil voice, Responsibility, School Community, Sharing Learning, Teamwork, Whole school, Wider Achievement, working together on 30/11/2018 by S Ketchin.